I love entertaining. I am not very social, but I do like being around people, feed them and see them have a good time. The stress of entertaining makes many people avoid it, or simply hate every minute they have people over, but it doesn’t have to be stressful. It really doesn’t. We, sadly, just moved out of a wonderful loft where we had people over as often as a family in the restaurant industry can. We’ve had people over for brunch, dinner, cocktail parties and Super Bowl parties, and I can say I have enjoyed hosting each of them. There are many ways you can make entertaining easier, this is how I make it virtually stress-free. Bring your personality into it: I grew up in Spain, so tapas is a no-brainer for me. I am also laid back and don’t like things to be too structured so the idea of small plates around a table and people mingling and eating really fits me. If you crave structure, make it a sit-down dinner, and if you have roots in the south, or make a mean fried chicken, go for it and serve it. Your guests will love to experience not just your food, but also your culture. It will also open up a great topic of conversation. Learn about your guests’ needs: You’ll feel terrible if at the last possible minute you learn that your guest has a severe nut allergy and everything you are serving contains nuts. Find out what your guests’ needs are and try to accommodate them by offering one or two items that they’ll be able to enjoy. Your guests will appreciate it. Stick to what you are good at: Use your go-to recipes and forget about what is trendy. There is no point in stressing over a recipe you’ve never tried before, unless it is something you are confident you can follow. I love to bake, and I am good at it, so I always make a cake or some other dessert. I am not much of a meat eater, however, so I will probably never serve BBQ, unless someone else is smoking the meat. If you are worried that your recipes are too simple, dress them up by setting them in nicer trays and garnishing them. 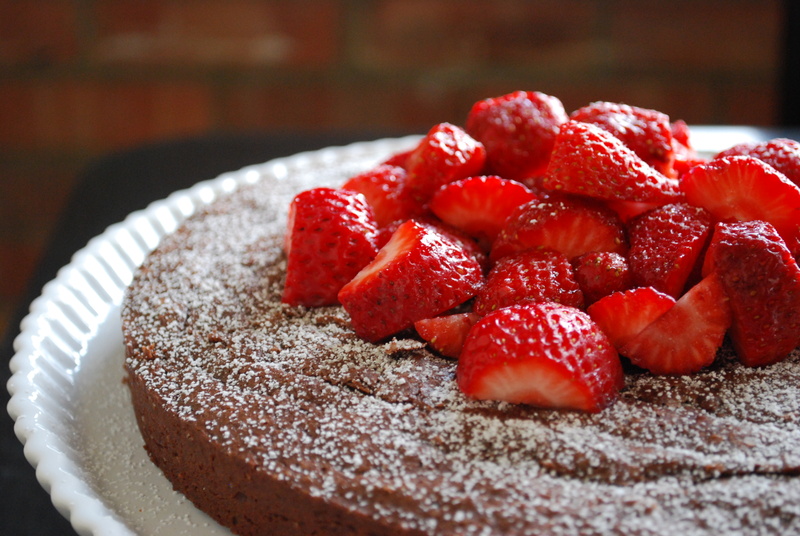 A simple recipe for brownies becomes party-worthy with a garnish of fresh strawberries and powdered sugar, and served on a cake stand. Think hors d’oeuvre: If your main dish won’t be ready until after your guests arrive, and even if you have it scheduled to be finished for when the doorbell starts to ring, set a table with drinks and hors d’oeuvre -like a nice cheese, fruit and bread plate, for example- to keep them entertained and fed while they wait and get comfortable. The wait won’t seem as long, and even if it takes longer than expected you can go with the flow and pretend it is all part of the experience. Buy some of the food already made: I usually buy things that I know I either can’t make better or I don’t have the time to make, just do it somewhere you trust and offers good quality. Many restaurants will sell trays of their appetizers or catering items, if you pick them up yourself you won’t have to pay a catering fee. Use this service to your advantage. Unless the food comes in platters that fit the party you are throwing, always transfer the food to your own serving trays. Set two or three food/drink stations: People will always congregate next to food and drinks, but this makes it difficult for others to access the food and creates an uncomfortable cluster around the table. By creating different stations you’ll give people options and create different groups. Guests who are extroverted will enjoy moving around and visiting with everyone, while your introverted friends will have a safe place to stay for the evening, while still being able to talk with others on their own time. Assign a bartender: If you have a co-host, you can give them the job of bartending for the earliest part of the event, this will ensure that everyone gets a drink and is pointed into the direction of the food. Your guests will also have a point of contact at the beginning of the party. After everyone arrives and has been served their first drink, the bartender can join the party and guests should be able to serve themselves. Keep decorations to a minimum: Unless you are super crafty and have a ton of time, decorations can be kept to a minimum. A clean and organized home with a fresh arrangement of seasonal flowers is enough. You could also make simple centerpieces using fruits and vegetables. For football parties, I’ve used helmets, pompoms and footballs as centerpieces. Be ready ahead of schedule: You mean you want to bake three loaves of bread and frost 30 cupcakes by 11 a.m.? Think again and set a realistic schedule for yourself. If you end up with extra time, you can use it to start opening the wine, sit down for a bit and enjoy your work. You should have everything ready at least 45 minutes before your guests are set to arrive so you can take a moment to breathe, get ready and enjoy all of your work. By the time people start trickling in, you’ll be ready to enjoy their company. Act as a match-maker: Not necessarily in the romantic way, but if you have people who don’t know each other, gently and intimately introduce them to one another offering something interesting about each of them, or something they may have in common. Open introductions can make some people uncomfortable, so leave the “ice breakers” to a minimum. Getting people to talk will ease everyone into the party and make it fun and comfortable from the start. Use music to set the mood: Music evokes emotions and a well-chosen playlist will allow you to set the mood. If you don’t have a ton of music to choose from, use a web-based service like Pandora and enter the types of music you want to listen to, just remember that as much as you enjoy Death Metal or grumpy singer-song writers, their music may not be the most conducive to conversation or dancing. Be a part of the party: You will never be stress-free if you are constantly running around the kitchen and the house cleaning up and nit-picking every single thing you’ve done. Take a minute to breathe, take a sip of your drink and enjoy the view of your guests have a good time, then allow yourself to become one of them and enjoy. Will you host family and friends for the holidays? Do you love or hate it?